This morning it's 70 degrees with 15 mph winds. In Redding that qualifies as Fall weather. So, on with sweater finishing. Next up is Loppem. This one had fallen by the wayside for a few reasons. First, I didn't like how the sleeves were turning out, even after redoing them twice. That sounds like more work than it really was. 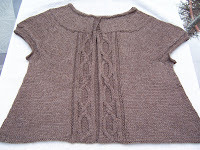 Loppem is a top-down pattern which is finished by picking up live sleeve stitches and adding a couple of inches. But they still didn't seem right and knitting them yet again was not appealing. Second, the bottom of the sweater was really curling up and I was worried it would be too short. Last, but not least, I knit Loppem right before Stitches West, and of course, I came home from the trip with plenty of other projects to distract me. Now though, with sweater weather outside, and the redemptive power of blocking fresh in my mind, I'm ready to whip this one out. I wove in the ends and washed it early this morning. I do believe that blocking is solving the issues I had. As soon as it is dry I will sew on the buttons. That was almost too easy. In my next post, I'll talk about why the 3rd project on my finishing list won't be as simple. T-shirt Sweater - Fix it or Frog it?